There is a deliberate attempt by domestic disgruntled groups to shackle India’s upswing nuclear energy drive. 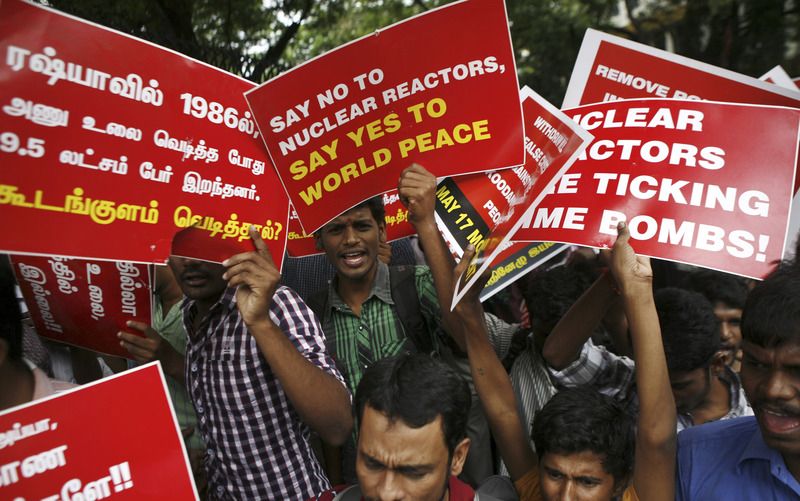 The Russian-built Kudankulam Nuclear Power Project is bearing the brunt of this campaign. Nuclear energy, however, can ensure India’s energy demand for the foreseeable future. Science, technology, and society are not passive partners. They constitute a dynamically interactive triad influencing each other significantly. But the question is, whether society always responds wisely to the scientific march, and if the evolution of technology is committed to the sustainability of society. Today nuclear technology seems to be standing at this crossroad. Many countries today confront public resistance when they expand or restart their nuclear plant operations. Yet, in very few countries have the anti-nuclear activists succeeded – not in America, France, Britain, South Africa, Brazil, Russia, South Korea, Sweden, China, or Canada. It will not prevail in Japan either. Germany is a dramatic exception. However, there have been cases in Australia and the U.S. where near-complete reactors have been halted by the weight of public opinion. Will India join this list? Pockets of resistance, and futile attempts to paint nuclear projects with political colour, are nothing new in India. What is annoying is the self-proclamation of sporadic opposition as the ‘anti-nuclear movement of India’ when there is no pan-Indian movement at all. Neither is there any visible ‘green politics’ in the Indian political mainstream, unlike in Europe. What is unfolding rather is the deliberate attempt by domestic disgruntled groups to shackle India’s upswing nuclear energy drive when the Indo-U.S. nuclear deal has unshackled it from the global technology denial regimes. Evidently, sporadic opposition to nuclear projects and its politicization started in 1988 when the local population and environmental groups opposed the Kaiga project in Karnataka. In 1989 Dr Shivaram Karanth, the protest leader, contested for the Parliamentary election, and got defeated. A Similar fate recurred with S.P. Udaykumar, the Kudankulam protest leader, who contested the parliamentary election as an Aam Admi Party (AAP) candidate. Subsequently he quit the party saying “the AAP high command failed to fulfil its assurance.” The AAP leader Arvind Kejriwal reportedly told him that “the middle class may not support him if he takes a stand against the nuclear plant since they saw these as employment opportunities for their children.” Rightly so, a major chunk of the Indian population is not against nuclear energy. After many futile politicization attempts, Udaykumar has launched his own political party ‘Pachai Tamizhagam’ (Green Tamil Nadu) with the aim to contest forthcoming elections. With a “manifesto dedicated to fighting against nuclear energy”, the party will “not contest to win but to make people aware” of the nuclear risks. As this is not his first foray, Udaykumar’s self-assumed leadership for heralding ‘green politics’ in India would be tested this time for how big a dent he can make in the next election. Moreover, the political void after Tamil Nadu Chief Minister J Jayalalitha’s demise would prompt the splintering parties to join hands with the left factions to resort to coalition formation around their anti-nuclear agenda. As per the International Atomic Energy Agency’s (IAEA’s) “Nuclear Technology Review 2009,” the Public Acceptance Index (PAI) of nuclear energy in India was increased from around 60 per cent in 2005 to around 90 per cent during 2008 and ranked the highest in the world. The global concerns over safety of nuclear reactors aftermath the Fukushima nuclear disaster also echoed in India leading to speculations on the state of Indian nuclear reactors. However, the popular concept of nuclear risk is heavily influenced by the imagination of consequences of catastrophic accidents – the ‘burden of perception.’ Therefore, each time a problem related to nuclear technology arises anywhere, a section of the media and civil society groups draw baseless parallels to India’s programme. They tend to forget that the nuclear risks, to a great extent are location-, and technology-specific. Undeniably, the public reaction is legitimate. After all public money is spent. But the public panic, based on the idea that ‘nuclear activity anywhere is a threat to humanity everywhere’ is manufactured, misplaced and over emphasized. In the process, the specificities and achievements of Indian nuclear projects are overlooked. The anti-nuclear cohort, before self-proclaiming as harbinger of ‘green politics’ in India, must consider the linear progression of Indian public attitude towards nuclear issues. Since 2001, “post-material” factors, to a great extent, have been shaping public attitude towards national and international issues. The post-material issues related to “quality of life” such as climate change, environment pollution, energy security, displacement, rehabilitation and the issue of safety-security of nuclear installations are linked to public support for, or opposition to, nuclear policy. The ‘civil society consciousness’ in India has visibly increased. Also the role of regional leaders and state government, beside their equation with the Union governments, would be more determining one for nuclear energy projects in future as a chain of new nuclear facilities are set to be sited in different states. Within this framework, one should judge public support for, or opposition to, nuclear projects in India to find that the anti-nuclear groups play no unique role for concerns of Indian public in regard to nuclear technology. In the domestic political domain, India also exhibits clear-cut nuclear alignments. So far, no Indian national political party has an anti-nuclear energy manifesto. Also one can easily notice the clearly divided domestic public opinion over the nuclear projects. While there are a few strong opponents of nuclear energy, many others strongly support and view nuclear as the viable source for India’s energy security. Meanwhile, a majority of the Indian population has not formed a firm opinion yet. These fence sitters would shift to either side of the divide depending on how quickly and what benefits of nuclear energy reach them. Moreover, the prevailing uncertainties involving safety-security and cost effectiveness of nuclear energy need to be resolved efficiently. While bridging the gap between the scientific community and the society, the public needs to be informed that every technology involves certain amount of risks and so also nuclear energy. But the benefit is much more than the risk involved if we do not fail the technology. The crux of the problem, therefore, is the manipulation of the gap between the Indian public and scientific community. Vested interests take advantage out of lack of information with the public or misinformation overdrive by media. This vicious circle needs to be breached through a nation-wide nuclear information management (NIM) network involving educational institutions, civil society, and nuclear energy cheerleaders. Otherwise it would be too late to realize that if technology is misunderstood, development will be abysmally missed. All must realize that the world has no other easy option and nuclear can ensure our energy demand for the foreseeable future. In fact, the Indian nuclear energy industry is a victim of the lopsided debate. For example, nobody bothers to unravel why the anti-nuclear champions don’t protest for the disasters that take place in the oil or aviation industry. Accidents happened, people died, and pollution spread because of man-made reasons, but the world has not abandoned oil or air travel. Rather, all strive to find what went wrong, try to fix it, and move on. Surprisingly, contrast is the case with nuclear industry. It is high time to stop demonizing nuclear technology and isolate such attempts of manufacturing socio-political panic. Dr Sitakanta Mishra teaches International Relations at the Pandit Deendayal Petroleum University (PDPU), Gujarat, India. Views expressed are personal.